I got this Chinese Horoscope from Megamall before Chinese New Year over 2 weeks ago. 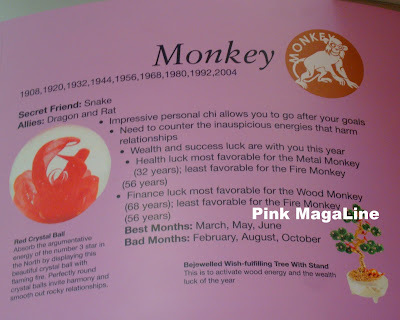 There was this large sticker on the wall with Chinese zodiac so I took a photo of my horoscope, being born in 1980 which was a year of the Metal Monkey. Absorbs the argumentative energy of the number 3 star in the North by displaying this beautiful crystal ball with flaming fire. Perfectly round crystal balls invite harmony and smooth our rocky relationships. This is to activate wood energy and the wealth luck of the year. I am not Chinese and I don't really believe in things like this. I was just curios. Anyway, blessings come to those who deserve it right? I mean okay, your horoscope says 2012 is most favorable to you when it comes to money, but that doesn't mean you won't do anything and just wait for cash to come to your door. In Filipino, "Nasa Diyos ang awa, nasa tao ang gawa". Same thing with health, relationship, etc. One needs to work for it. I'm a rat :)I can be your ally sis! Like you, I also enjoy reading my horoscope, and like you, I also not rely too much on what my horoscope says. While I want this year to be a lucky year for me, I know I have to work hard to get what I want. Thanks for the visit!